Viewing topic "Use motif xf as audio interface"
Hi i’m new in this forum and i have recently bought a motif xf 7. My question is...is it possible to use motif xf as audio interface without buying any expansion directly on the computer?? i mean something like put a guitar jack in the line input of the motif and record on the computer..if is it possible,is the quality good? The answer is Yes and No. Your question is not really defined or specific. And your goal is not clear… but here is what is going on. Firstly, there has to be a guitar connected to that “guitar jack” when you plug it into the Motif XF. Yes - you can record the guitar, without having an audio interface, without purchasing the FW16E, and yes you can transfer that audio to the computer. But if you mean can you use a DAW (Digital Audio Workstation) software and record as if you had a proper Audio Interface - well, no of course not… or I should say, that it will depend on the specific DAW software you are thinking about. Each DAW has its own requirements - check the documentation of that software for its requirements. Most REQUIRE an audio interface to do what they do with external audio sources. 1) Recorded to the XF’s own built-in SDRAM (sampled by the Integrated Sampling Sequencer) then export the audio to the computer. 2) Output the audio directly to a USB Stick or Hard Disk connected to the XF’s TO DEVICE port,then transfer the audio to the computer. Any audio recorded to the Motif XF’s Integrated Sampling Sequencer can be SAVED in a Motif XF ALL data file (.X3A). This file can then be IMPORTED by Cubase (File > Import > Motif XF Song) - and each MIDI Track of the selected SONG will be imported to a Cubase MIDI track and any audio Track recorded to the XF’s ISS will be imported to a Cubase audio Track. 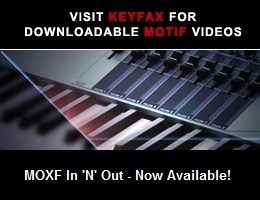 The Motif XF has the ability to write a stereo .wav file (16-bit/44.1kHz) in real time to a connected drive. All data coming into the 18 channel mixer will be recorded. The 18 Channel mixer includes the 16 internal synth PARTS, plus the A/D INPUT, plus the (optional) FW input. The file can then be manually ‘shuttled’ over to the computer. The XF has networking capability such that audio from its mixer are broadcast as a stereo (16-bit/44.1kHz) file. This can be captured wirelessly by devices like an iPAD or iPhone using apps like Cloud Audio Recorder for Motif XF. Or you can connect the XF via an Ethernet cable to your computer and capture the audio (in a similar fashion to the USB Audio record). This stereo digital output is available to connect to any computer equipped with a proper S/PDIF input. SInce you did not mention DAW software - we are not going to mention it either, other than to say - because most DAW software require some type of audio interface device to accommodate things like overdubbing, and routing of signal as apart of its function. It will depend on that software. Your question was about getting audio from the A/D input into a computer - since you did not specifiy any particular type of recording or any particular type of software - we provide you with the alternate methods. In general, if you are talking about recording to a DAW software (again you did not say this) - it will obviously depend on the requirements of that software. As soon as professional DAW computer software is ready to record audio via wi-fi, your XF is ready to send it! Depending on the DAW software - the XF is capable of multi-tracking audio to a computer using the Yamaha Steinberg FW ASIO driver - this is by far the most flexible and powerful method (it does require the FW16E - firewire audio interface) and allows you to record pristine 24-bit audio at sample rates up to 96kHz. You get the option to route individual PARTS from the XF’s 18-channel mixer via 16 audio buses. Welcome to Motifator Forum and well done on your Motif XF acquisition. It’s nice to have a new member from Italy on board. Enjoy your time in the Forum. Hi - I am trying to solve a similar issue as Kapily - connect my iPad and record MIDI to an iPad DAW - Cubasis or Auria. I tried the video link but it is not working - says video unavailable. Can you please provide some guidance? Am really stuck...any help will be greatly appreciated. Easy actually. First, do you have an iPad with Lightning or USB-C or the older 30-pin cable? If Lightning, simply buy the USB-Lightning Camera adapter and a USB-B to USB-A cable. Connect the cable to the USB-B port on the Motif, the other end to the Camera adapter, and the other part of the Camera adapter to the lightning port on your iPad. Set the MIDI interface to “USB” instead of “5pin” in the Utility menu on the Motif. Should work. If not make sure you have your MIDI channels set the same in your software and the Motif.